3i Series, Other Accessory For Microphone from SKB. SKB Corporation announced a new line of injection molded mic cases. 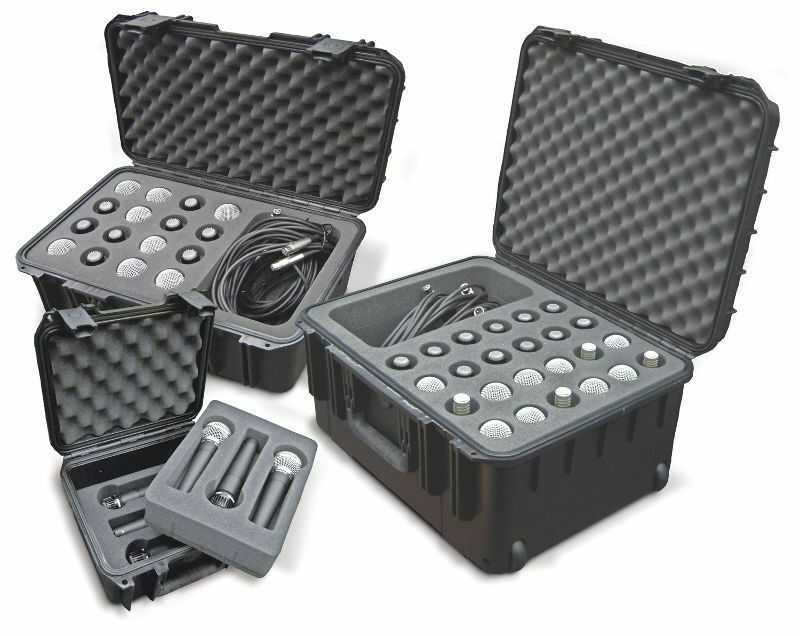 The 3i-0907-MC6 holds six mics in a compact case while the 3i-2011-MC16 holds 16 mics stored vertically and the 3i-2015-MC24 stores 24 mics in a rolling case. The new line is based around SKB's 3i series cases. 3i Series injection molded waterproof cases are constructed of polypropylene copolymer resin and feature a gasketed, waterproof and airtight, submersible design (IP67) that is resistant to corrosion and impact damage. Its continuous molded-in hinge, "trigger release" latch system, snap-down rubber over-molded cushion grip handle, secure stacking, and automatic ambient pressure equalization valve (MIL-STD-648C) all contribute to its military grade design. The interior foam is cut on the new water jet machine SKB is now using to cut custom foam and design new products. Each case has convoluted foam in the lids. The 3i-0907-MC6 is allows for 3 mics to stored horizontally on two separate layers of foam. The 0907-MC6 measures 9" x 7" x 6" deep and is the most compact 6-mic case on the market. The 3i-2011-MC16 houses up to (16) mics stored in the vertical position. The two step mic holes are designed to secure any type of mic. In addition the case includes a padded storage compartment for cables and mic clips. The 3i-2015-MC24 is the largest mic case and holds (24) mics vertically and is deep to accommodate longer condenser mics. 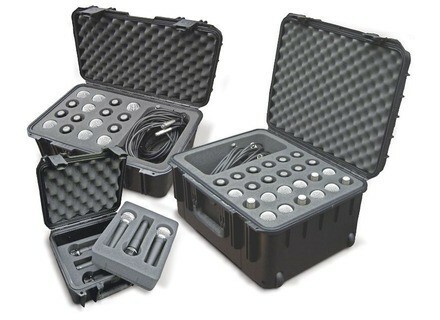 This case includes a padded accessory compartment for storage of cables, mic clips or other mic essentials. The 3i-2015-MC24 also includes an injection molded handle along with in-line skate wheels. The new mic cases are covered by SKB's Lifetime Warranty. For more information, visit www.skbcases.com. [Musikmesse] Audio-Technica 2000a to 5000a Series Upgraded wireless systems in Audio-Technica’s 2000, 3000, 4000 and 5000 Series are making their Prolight+Sound / Musikmesse debut in Frankfurt between 24-27 March 2010. [Musikmesse] Audio-Technica MCB4 Antenna Combiner A new in-ear monitor antenna combiner, the MCB4 is being shown by Audio-Technica at Prolight+Sound / Musikmesse 2010 for the first time. [Musikmesse] Audio-Technica U843R Audio-Technica is showing its new U843R three-channel boundary microphone at Prolight+Sound / Musikmesse 2010.